Home and away, all weather Sport-Tek support true champions. Not all champions are the star players, they can be the grafters, the team workers, the substitutes the guys who go all year putting in the extra work without being noticed or acknowledged. These guys are still champions and now it is time for them to start getting the credit they deserve. Sport-Tek celebrates these champions, and encourages them to stand up and be counted for. Take what is rightfully theirs. Live like champions. The foundation which Sport-Tek provides modern, hi-tech, stylish active wear. Sport-Tek captures the spirit of true athletic styling with unique fabrics, modern design and a trend-right colour palette. In addition to fashionable colours found in the latest retail designs, Sport-Tek styles are available in most popular team colour combinations. The Sport-Tek collection ranges from performance apparel to athletic heritage and casual streetwear. Sport-Tek is perfect for schools, teams, resorts, community organizations and the corporate world. Sport-Tek’s Long Sleeve PosiCharge Competitor Tee exemplifies everything we stand for. It is ideal for indoor or outdoor sports. 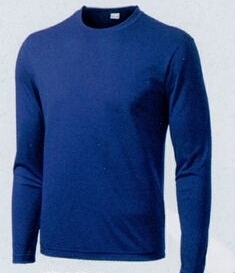 The long sleeves and round neck is a classic look which can be worn at any occasion. The amazing colour range is perfect for any sports team or brand as the tops are also easily customizable. The colours are as follows; Black, Deep Orange, Forrest Green, Gold, iron Grey, Lime Shock, Silver, True Navy, True Red, True Royal and White. This colour range shows great versatility; where the True Red is very popular with sport teams, the True Royal is very popular with organisations and companies. Lightweight, roomy and highly breathable, these moisture-wicking, value-priced tees feature PosiCharge technology to lock in colour and prevent logos from fading. For maximum comfort it is super light weighing 3.8 ounces of 100% cationic polyester interlock. The gently contoured silhouette has a removable tag for comfort and relabelling, which is extremely important for customization for brands and teams. The slight scoop neck and set-in sleeves gives comfort in any weather. Sport-Tek’s Long Sleeve PosiCharge Competitor Tee is easily cared for too; machine wash cold with like colours, non-chlorine bleach only if needed, do not use fabric softener, tumble dry low, remove promptly, cool iron if necessary, do not dry clean. Adult sizes go from XS, S, M, L, XL, 2XL, 3XL and 4XL.